Detection of donor-specific anti-HLA antibodies in patients with kidney graft, or awaiting kidney graft, acts as a predictor for antibody mediated rejection. Several methods are in practice for the detection of anti-HLA antibodies; including the latest introduction of C1q-binding anti-HLA antibody method. This method depends on detecting complement fixing anti-HLA antibodies on single antigen beads using C1q as the marker for the presence of those antibodies. Here we discuss recent data on this method and present a working hypothesis for explaining the inability of this method to detect low titer anti-HLA antibodies. Vitamin D deficiency is very prevalent among the patients with end-stage renal disease. The etiology of this is multifactorial, including nutritional deficiency, insufficient expo- sure to sunlight, race, obesity and not the least, impaired Vitamin D synthesis and metabolism in chronic kidney disease patients. We hypothesized that lower Vitamin D level will be associated with higher inflammatory burden and low immunological response to hepatitis B vaccination in hemodialysis (HD) population. The study was carried out in March 2013 among 100 HD patients who were identified to be eligible for the study. This was a cross-sectional study analyzing the relationship between Vitamin D level and inflammatory markers in HD patients. 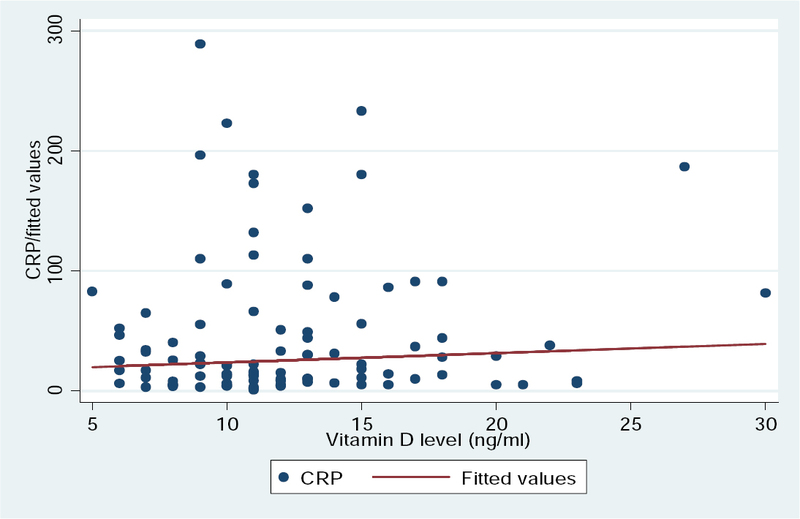 A relationship between Vitamin D level and markers of mineral bone disorder was also analyzed. We also analyzed the relationship between Vitamin D level and hemoglobin and erythropoietin dosage. Hemoglobin, transferrin saturation, and erythropoietin dose were used to study the relationship between Vitamin D and markers of anemia. Antibodies to hepatitis B surface antigen were measured to study the response between Vitamin D level and immune response to hepatitis B vaccine. Vitamin D levels were significantly lower in females compared to males (P = 0.009) and diabetics compared to non-diabetics (P = 0.02). No significant association was observed between Vitamin D levels with immune response to hepatitis B vaccine (P = 0.89), C-reactive protein (P = 0.19), serum albumin (P = 0.17), hemoglobin level (P = 0.18,) and erythropoietin requirement (P = 0.87), parathyroid hormone (PTH) levels (P = 0.57), calcium levels (P = 0.79) and phosphate level (P = 0.1). Severe peritonitis causing death is one of the most devastating complications of peritoneal dialysis (PD). Since the predictive value of C-reactive protein (CRP) in PD fluid has not been assessed, the objective of the present study is to evaluate its predictive value and clinical correlation in patients on PD with peritonitis. One hundred and twenty patients on continuous ambulatory PD (CAPD) were enrolled and their serum and fluid CRP (Fl. CRP) were evaluated at the start of CAPD. All patients who developed peritonitis were further evaluated for serum and fluid CRP. The patients were categorized into four groups, namely: normal patients (control group), patients with peritonitis, patients with peritonitis leading to catheter removal, and death due to peritonitis. Sixty-five patients developed peritonitis of whom, catheter removal was performed in eight patients. Five patients died due to peritonitis-related complications. Fl. CRP showed a significant difference among the three groups, unlike S. CRP. 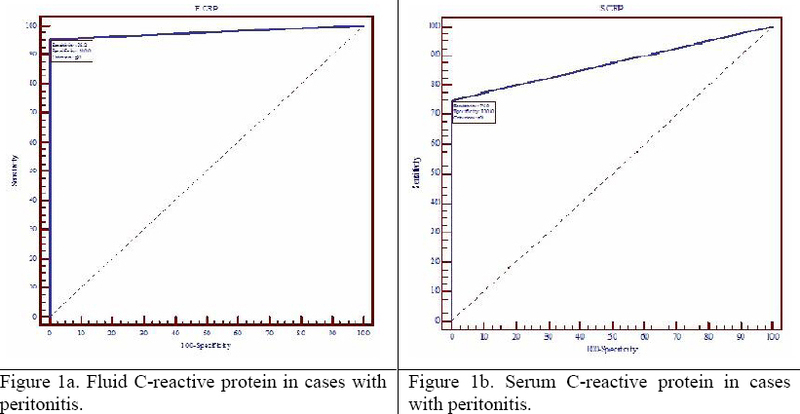 Estimation of CRP in the peritoneal fluid may be a useful marker to monitor the onset of peritonitis. Microalbuminuria is an independent risk factor for cardiovascular and renal out- come in a patient with Type 2 diabetes. The evidence that intensive glycemic control reduces the microvascular complications of diabetes is based almost exclusively on prevention of micro- albuminuria. To evaluate the association between microalbuminuria and glycemic control and other factors in Type 2 diabetes, we studied retrospectively 551 patients with Type 2 diabetes. The patients were divided into two groups: 175 patients with microalbuminuria in the case group and 376 with normal urine albumin-creatinine ratio in the control group. Our data indicated that there was a significant association between the uncontrolled glycemia and development of microalbuminuria and that was more obvious if HbA1c level was >11%. Our data also indicate that there was a statistical significant association between male gender, age, the systolic and diastolic blood pressure (DBP) levels, and the microalbuminuria in crude odds ratios (ORs). We conclude that there was a clear association between the glycemic control and microalbuminuria, and microalbuminuria was associated with older age, male gender, and systolic and DBP in crude ORs. To determine the features of the different forms of kidney diseases associated with multiple myeloma (MM), we retrospectively studied 144 patients with kidney injury and MM at our institute from 1974 to 2014. The mean age of the patients was 60.1 years and the male:female ratio was 1.25. Renal disease was concomitant with the discovery of MM in 92% of cases. The mean follow-up of our patients was 2.1 years. Initial renal insufficiency was found in 131 (91%) patients. Cast nephropathy of the distal tubule was found in 110 (26%) patients, renal amyloidosis in 16 (11.1%), and light chain deposition disease in five (3.47%). Twelve (8.3%) patients had chronic glomerular nephropathy. Twenty-six patients reached end-stage renal failure within 13.4 months. Renal survival was 30.45 months. Predictive factors for improvement of renal function undergoing chemotherapy included serum creatinine <250 µmol/L, proteinuria <1 g/24 h, and the non-use of renal replacement therapy. Multiple pathogenic mechanisms can contribute to kidney injury in myeloma patients. Novel myeloma agents have shown considerable promise in reversing renal failure in some patients and improving outcomes. Phototherapy is the most common, most effective, and least dangerous treatment method for neonatal hyperbilirubinemia and is the treatment of the first choice for neonatal icterus. Hypocalcemia is one of the lesser-known complications of phototherapy. Some studies have shown a relationship between increased urinary calcium excretion and phototherapy-induced hypocalcemia. We aimed to assess the effect of phototherapy on urinary calcium excretion in term neonates. 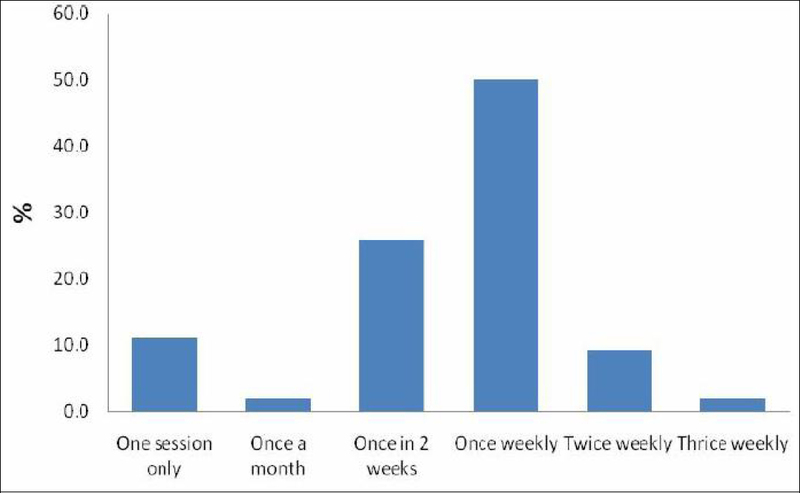 This before-after study was performed on 80 term neonates having hyper- bilirubinemia referred to the 17thShahrivar Hospital, Rasht, Guilan Province, Northern Iran, over a one-year period from May 2013 to May 2014. Electrocardiography was performed to measure QTc in all neonates at admission and 48 h after phototherapy. Blood and urine samples were taken from all neonates before and 48 h after phototherapy. Phototherapy was performed using four lamps with similar wavelengths from a distance of 20 cm. The serum and urinary calcium and sodium levels and urinary creatinine level before and after phototherapy were measured and compared. Data were analyzed using SPSS software, version 16. The mean age of the study subjects was 7.01 ± 4.13 days. We did not find any significant difference between urinary calcium levels (P = 0.0001), urinary creatinine levels (P = 0.954), or the calcium/creatinine ratio (P = 0.086) before and after phototherapy. The neonates' mean ± standard deviation plasma as well as urinary sodium levels differed before and after phototherapy; the difference was not statistically significant (P = 0.658). Phototherapy might increase urinary calcium excretion although it does not cause hypocalcemia. Only a few studies describe histopathological changes in renal biopsies performed in pediatric patients. This study was conducted to identify an association between morphometric data in renal biopsies and renal function of these patients. Fifty-nine individuals with ages between 2 and 18 years old were selected, who were divided into six groups consisting of frequent nephropathies in children and adolescents and one control group. Proteinuria, urea, and creatinine values of the patients were recorded. Interactive image analysis software Leica QWin[®]was used for morpho- metric analysis of Bowman's capsule, glomerular capillary tuft, and Bowman's space area. 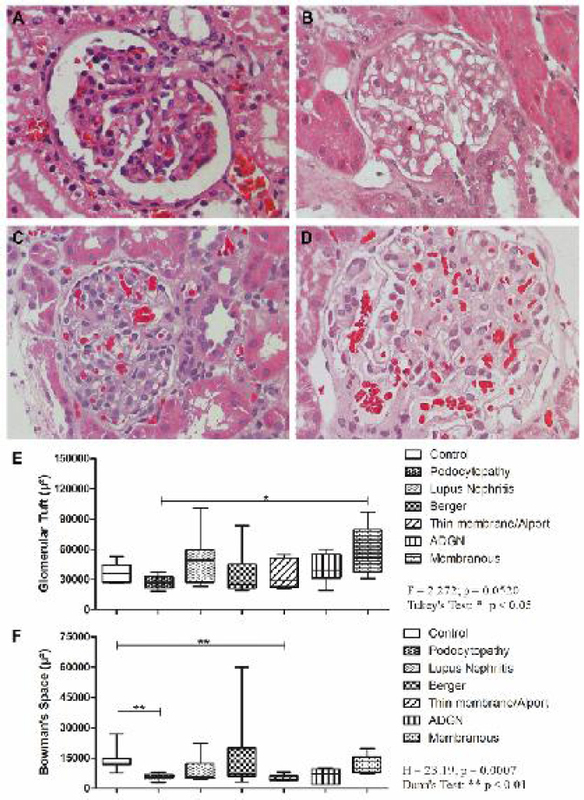 The mean glomerular tuft area was higher in the membranous glomerulopathy group than in the podo- cytopathy group (57,101 ± 25,094 vs. 27,420 c ± 6279 µm2; P <0.05). The median of Bowman's space area was higher in the control group than in the podocytopathy group and in the thin basement membrane/Alport syndrome group [12,210 (7676-26,945) vs. 5801 (3031-7852) µm2; P <0.01 and 12210 (7676-26,945) vs. 4183 (3797-7992) µm2; P <0.01, respectively]. There was a positive and significant correlation between Bowman's capsule area and the levels of proteinuria, creatinine, and urea of the patients, as well as between the glomerular tuft area and the levels of proteinuria, creatinine, and urea in the patients, regardless of their nephropathy. Glomerular morphometry may contribute to the diagnosis of some glomerulopathies and the association between glomerular morphometric parameters, and laboratory data may promote a better understanding of the prognosis of these patients. To determine the prevalence of asymptomatic urinary abnormalities in adolescents, first morning clean mid-stream urine specimens were obtained from 2500 individuals and examined by dipstick and light microscopy. Adolescents with abnormal screening results were reexamined after two weeks and those who had abnormal results twice were subjected to systemic clinical examination and further clinical and laboratory investigations. 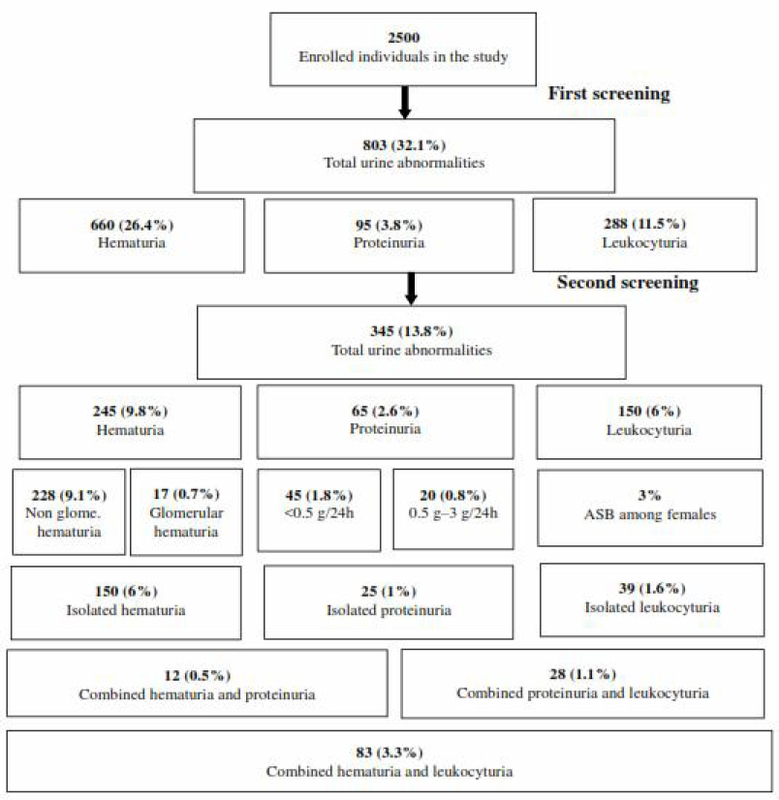 Eight hundred and three (32.1%) individuals had urinary abnormalities at the first screening, which significantly decreased to 345 (13.8%) at the second screening, (P <0.001). Hematuria was the most common urinary abnormalities detected in 245 (9.8%) adolescents who had persistent urine abnormalities; 228 (9.1%) individuals had non glomerular hematuria. The hematuria was isolated in 150 (6%) individuals, combined with leukocyturia in 83 (3.3%) individuals, and combined with proteinuria in 12 (0.5%) individuals. Leukocyturia was detected in 150 (6%) of all studied adolescents; it was isolated in 39 (1.6%) individuals and combined with proteinuria in 28 (1.1%) of them. Asymp- tomatic bacteriuria was detected in 23 (0.9%) of all studied adolescents; all the cases were females. Proteinuria was detected in 65 (2.6%) of all the studied adolescents; 45 (1.8%) indivi- duals had <0.5 g/day and twenty (0.8%) individuals had 0.5-3 g/day. Asymptomatic urinary abnormalities were more common in males than females and adolescents from rural than urban areas (P <0.01) and (P <0.001), respectively. The present study found a high prevalence of asymptomatic urinary abnormalities among adolescents in our population. Adult patients with chronic kidney disease are at risk of major neurologic and cardiac complications. The purpose of this study is to review the neurological and cardiac complications in children with end-stage renal disease (ESRD). A retrospective review of medical records of children with ESRD at Jordan University Hospital was performed. All neurological and cardiac events were recorded and analyzed. Data of a total of 68 children with ESRD presenting between 2002 and 2013 were reviewed. Neurological complications occurred in 32.4%; seizures were the most common event. Uncontrolled hypertension was the leading cause of neurological events. Cardiac complications occurred in 39.7%, the most common being pericardial effusion. Mortality from neurological complications was 45%. Neurological and cardiac complications occurred in around a third of children with ESRD with a high mortality rate. More effective control of hypertension, anemia, and intensive and gentle dialysis are needed. Diabetic nephropathy (DN) is one of the most important causes of the end-stage renal failure and its prevalence is found to be increasing. The presence of hypertension and progressive proteinuria is among the important findings. In this study, the effects of double and triple combinations of trandolapril, telmisartan, and verapamil on proteinuria were investigated in diabetic patients with nephropathy. Seventy-eight patients (mean age: 56.11 ± 11.26 years; 47 females and 31 males) with overt proteinuria and DN were included in this study. The patients were divided into four groups: Group I (n: 18, trandolapril + telmisartan), Group II (n: 20, trando- lapril + verapamil), Group III (n: 20, trandolapril +telmisartan + verapamil), and Group IV (n: 20, telmisartan + verapamil). At the end of a three-month therapy, within and between group compa- risons were done about the effects of the use of double or triple drug combinations on proteinuria, glomerular filtration rate (GFR), electrolytes, serum albumin, low-density lipoprotein (LDL)- cholesterol, and HbA1C. There was no significant difference among groups in terms of age, gender, diabetes duration, body mass index, and retinopathy frequency. The decreases in protei- nuria and mean arterial blood pressure (MABP) were significant in all groups. The decrease in proteinuria was independent of the decrease in MABP [the reduction rate in proteinuria was 39% (P <0.001) in Group I, 37% (P <0.001) in Group II, 42% (P <0.001) in Group III, and 43% (P <0.001) in Group IV; the reduction rate in MABP was 10.6% (P <0.001) in Group I, 13.7% (P <0.001) in Group II, 17.5% (P <0.001) in Group III, and 15.4% (P <0.001) in Group IV]. Decrease in HbA1C (before and after treatment) was significant in Groups III and IV when com- pared to Groups I and II. Any adverse event, like hyperkalemia, was not observed. There was no significant difference among the groups in terms of GFR, LDL-cholesterol, albumin, and potassium. All the patients tolerated the drugs well. In conclusion, in patients with DN, both double or triple combinations of trandolapril, telmisartan and verapamil resulted in signi- ficant decreases in proteinuria and MABP. Triple combinations did not have any supe- riority over double combinations. Therefore, the suitable drug combinations may be chosen according to the clinical status of a patient. 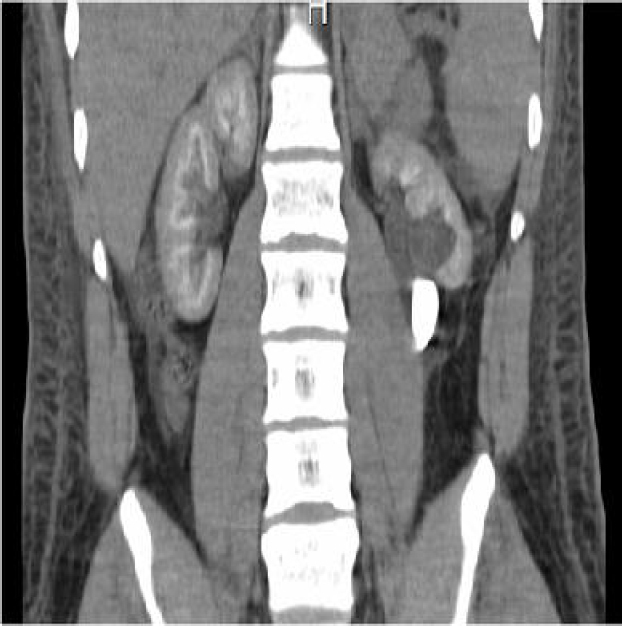 Contrast-induced nephropathy (CIN) is one of the important complications of radiographic procedures, especially in patients with chronic kidney disease. It is also one of the common causes of acute kidney injury. The pathogenesis is postulated to be the effect of oxygen- free radicals and hyperosmolar stress on the renal medulla. It is reported that the production of superoxide is most active at acid environment. K/Na citrate is well known as a urine alkalini- zation medium, and this has been evaluated earlier with standard hydration for reduction of CIN and was stated to be efficient. We aimed to determine the efficacy of Na/K citrate in reducing the frequency of CIN in comparison to sodium bicarbonate in patients after coronary angiography. Two hundred and ten patients with renal dysfunction [estimated glomerular filtration rate (eGFR), 60 mL/min/1.73 m2or less] who underwent elective or emergency coronary angiography (CAG) with/without percutaneous coronary intervention (PCI) at our institution were enrolled into the study. The patients were randomized into two groups, Group 1-Taking Na/K citrate and Group 2-Taking sodium bicarbonate. Radiographic contrast agent iohexol was used. Change in creatinine, percent change in creatinine, percent change in eGFR, change in serum potassium, and urine pH were all compared between the two groups. There was no significant difference for prevention of CIN when comparing the Na/K citrate with sodium bicarbonate solution in patients exposed to CAG with or without PCI. Mean absolute change in eGFR after 48 h after administration of contrast between sodium bicarbonate group and Na/K citrate group was −0.60 ± 1.58 versus −0.71 ± 1.38. Serum potassium decreased postprocedure in the sodium bicarbonate group than in the citrate group (3.90 ± 0.33 vs. 4.14 ± 0.39). Both agents are equally effective in reducing the incidence of CIN, but the citrate would possibly be a safer option for patients at risk of hypokalemia. The infantile form of primary hyperoxaluria type-1 (PH-1) is characterized by a rapid progression to the end-stage renal disease (ESRD) due to both increased oxalate load and reduced glomerular filtration rate. In the literature, data on this form are limited. The purpose of this study is to analyze retrospectively the clinical, biological, and radiological features of children who were diagnosed with PH-1 during the 1styear of life. We reviewed the records of all children with PH-1 diagnosed and followed-up at our department between January 1995 and December 2013. Among them, only infants younger than 12 months of age were retrospectively enrolled in the study. Fourteen infants with the median age of two months were enrolled in the study. At diagnosis, 11 patients had ESRD. 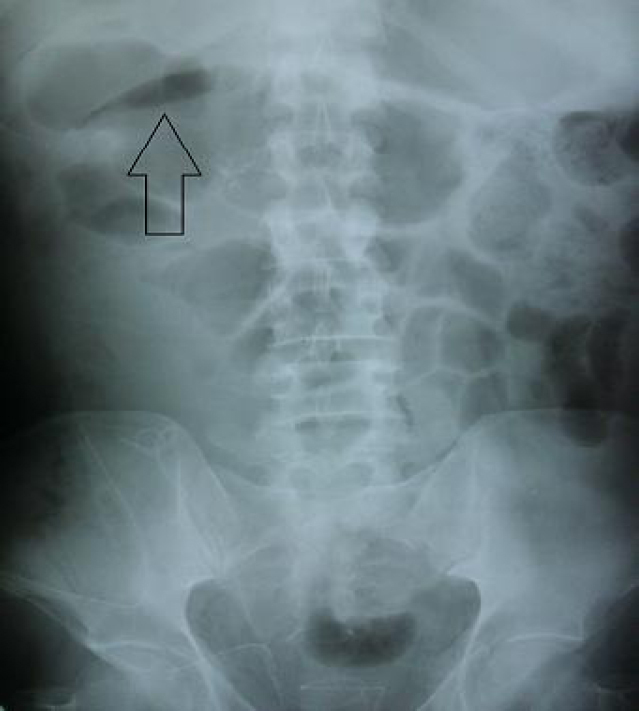 All patients had nephrocalcinosis and two of them had calculi. The diagnosis was established in nine patients on the basis of the positive family history of PH-1, bilateral nephrocalcinosis, and quantitative crystalluria. In four patients, the diagnosis was made with molecular analysis of DNA. Kidney biopsy contributed to the diagnosis in one patient. During follow-up, two patients were pyridoxine sensitive and preserved renal function. Seven among 11 patients who had ESRD died, four patients are currently undergoing peritoneal dialysis. Children with infantile PH and ESRD are at high risk of early death. Peritoneal dialysis is not a treatment of choice. Combined liver-kidney transplantation is mandatory. To determine the relationship between resistive index (RI) measured by Doppler ultrasound, serum creatinine (SCr), and histopathological changes on biopsy during kidney trans- plant dysfunction in early postoperative period, we studied 47 kidney transplant patients; 61% of the patients had acute transplant rejection, 19% had acute tubular necrosis, 4% had calcineurin inhibitor toxicity, 11% had normal morphology in biopsy, and 5% had changes compatible with pyelonephritis. None of the study patients had interstitial fibrosis or tubular atrophy on biopsy. We found that the sensitivity and specificity of RI in diagnosing transplant dysfunction was highly variable depending on the selected cutoff value. Sensitivity of RI decreased and its specificity increased with increasing the RI thresholds. Using an RI threshold of 0.7 resulted in a high sensitivity of 78% at a cost of very low specificity 40%, whereas using an RI threshold of 0.9 resulted in 100% specificity at a cost of very low sensitivity 16%. Acceptable specificity was only achieved at the expense of very low sensitivity, resulting in poor utility of RI as a screening tool for dysfunction. We found that there were no significant differences in the mean RI value between patients with and without biopsy-proven transplant dysfunction. However, we found a significant correlation between SCr value and RI of 0.383, P = 0.007. Diagnosis of membranous nephropathy (MN) and focal and segmental glomerulo- sclerosis (FSGS) needs a renal biopsy, which is an invasive procedure with potentially serious complications. Proteomics may be applied for the development of a biomarker for these diseases which will obviate the need of biopsy. 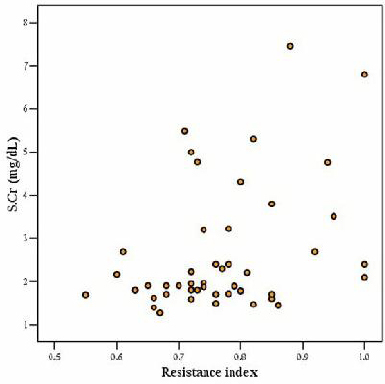 Serum sodium dodecyl sulfate-polyacrylamide gel electro-phoresis (SDS-PAGE) analysis gives an idea of the various proteins with different molecular weights (MWs) in a given sample. This study was conducted to analyze proteins with different MWs in patients with MN and FSGS and to compare the two groups with regard to their protein profile. This was a comparative, experimental study performed from June 2013 to July 2014 in the Department of Nephrology, Sir Sunderlal Hospital, Banaras Hindu University, Varanasi. Twenty-three histologically diagnosed cases of primary MN and 25 cases of FSGS were included in the study. Patients were categorized as having mild, moderate, and severe proteinuria with 24 h urinary protein levels of <4, 4- 8 and ≥8 g/24 h, respectively. SDS-PAGE analysis was performed by the method of Laemmli and revealed a significantly higher number of patients with FSGS (80%) having a protein corresponding to 29 kDa MW, than those with MN (39.1%) (P = 0.004). 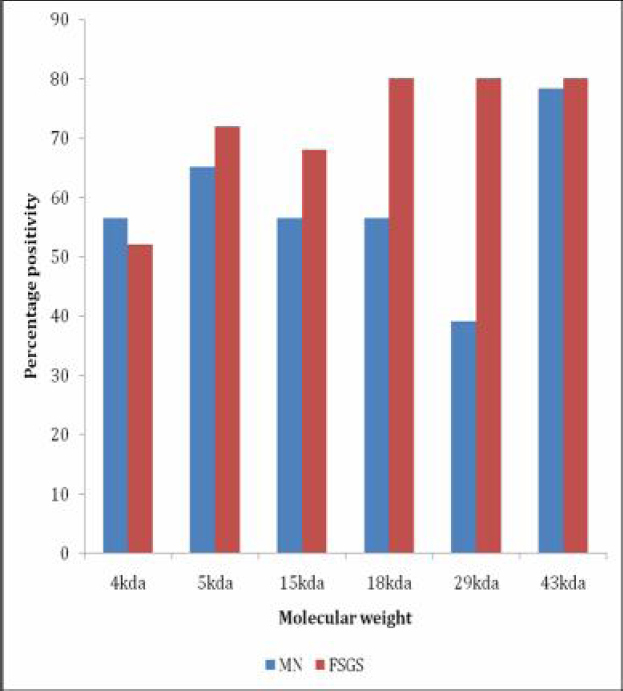 Protein of 5 kDa MW was present in a significantly higher number of patients with moderate (80%) and severe (100%) proteinuria than those with mild proteinuria (25%) (P <0.001). Thus, protein of MW 29 kDa may be a marker for FSGS and needs further characterization. Similarly, 5 kDa protein, present in patients with moderate and severe proteinuria, might be either contributing to or be a marker of severe illness. The end-stage of renal disease is associated with increased oxidative stress and oxidative modification of low-density lipoproteins (LDLs). Beta2 microglobulin (beta2M) is accumulated in the serum of dialysis patients. Magnesium (Mg) plays a protective role in the development of oxidative stress in healthy subjects. We studied the relationship between concentrations of magnesium and oxidized LDL (ox-LDL) and beta2M in the serum of patients on the end stage of renal disease. In 96 patients on on-line- predilution hemodiafiltration, beta2M and intact parathormone were measured by radioimmunoassays. High-sensitivity C-reactive protein (hsCRP) and ox-LDL were measured using ΕLISA. Serum bicarbonate levels were measured in the blood gas analyser gas machine. We performed logistic regression analysis models to investigate Mg as an important independent predictor of elevated ox-LDL and high beta2M serum concentrations, after adjustment to traditional and specific for dialysis patients' factors. We observed a positive correlation of Mg with ox-LDL (r = 0.383, P = 0.001), but the association of Mg with beta2M, hsCRP, and serum bicarbonate levels was significantly inverse (r = −0.252, P = 0.01, r = −0.292, P = 0.004, and r = −0.282, P = 0.04 respectively). The built logistic-regression analysis showed that Mg act as a significant independent factor for the elevated ox-LDL and beta2M serum concentrations adjusting to traditional and specific factors for these patients. We observed a positive relationship between magnesium and acidosis status- related ox-LDL concentrations, but the inverse association between magnesium and beta2M serum concentrations in hemodialysis patients. Hemodialysis (HD) safety has become a clinical priority; therefore, the use of checklists for making the dialysis session safe is now widely adopted. The aim of our study was to assess different shortcomings in the clinical practice of nurses working in different Moroccan dialysis centers and to discuss the interest of using such checklists. This cross-sectional study was performed in 13 chronic HD centers. Clinical practice of nurses was evaluated through checklists used in European outpatient dialysis units. We noted several deficiencies mainly related to the clinical evaluation of dialysis patients and to aspects related to hygiene and protection measures against contamination. Optimal safety of dialysis sessions requires the use of simple and reproducible means that improve clinical skills of the health staff. To evaluate the clinicopathological correlation of renal pathology and outline the frequencies of different renal diseases, beside assessment of lupus nephritis (LN), we studied 150 patients [72 (48%) males and mean age of 33.82 ± 15.4 years] who were subjected to native renal biopsy; 112 (72.8%) biopsied patients were diagnosed to have glomerulonephritis (GN). The most frequent clinical renal syndrome was nephrotic syndrome found in 55 (36.6%) patients, followed by nephritic syndrome in 38 (25.3%) patients, chronic kidney disease in 28 (18.6%) patients, acute kidney injury (AKI) in 17 (11.3 %) patients, and subnephrotic proteinuria (SNP) in 12 (8%) patients. Focal segmental glomerulosclerosis (FSGS) was the most common patterns in primary GN (16.6%), LN was the most common pathology in secondary GN (33.3%). LN represented 18.1% of nephrotic syndrome, 68.3% of nephritic syndrome, 35.2% of AKI, and 58% of SNP. FSGS was the most common pattern in obese patients (58%), membranoproliferative GN (MPGN) was the most common pattern in hepatitis-C virus +ve patients (66.6%) and mem- branous GN was the most common pattern in hepatitis-B virus +ve patients (66.6%). In conclusion, GN was the most common pathology in this study, FSGS and MPGN were the most common patterns in primary GN. Kidney transplantation from living kidney donors (LKDs) because of its good results represents a good option for the treatment of patients with the end-stage renal disease. Kidney donation is a relatively safe procedure according to several studies. We conducted this cross-sectional study in order to describe the demographic, clinical, and renal outcome of LKD in Cτte d'Ivoire. From March to November 2014, LKD residing in Cτte d'Ivoire at the time of investigation and having donated the kidney more than one year ago were considered for the study. They were evaluated through a questionnaire. Of the 29 LKD listed in Cτte d'Ivoire, only 14 responded to the questionnaire. The mean age at donation was 43.29 ± 9.12 years (27-59) and 10 of the LKD were women. Eight were related to the recipients, and the remaining were spouses. Laparoscopic nephrectomy was performed in nine LKD. The left kidney was harvested in ten cases. The main motivation for donation in all donors was the desire to save a life. At the time of the survey, the average duration after the donation was 4.57 ± 2.56 years (1-8). Only five donors had a regular nephrological follow-up. Hypertension was observed in one donor, seven had significant proteinuria, and six had glomerular filtration rate <60 mL/min but >30 mL/min. Significantly higher proteinuria was noted in donors under 45 years as compared to those over 45 years (0.43 ± 0.17 g/24 h vs. 0.22 ± 0.03 g/24 h, P = 0.01). Our study suggests that renal disease in LKD in Cτte d'Ivoire is low after a mean follow-up period of four years. A donor registry is essential to ensure better follow-up of donors in order to detect potential adverse effects of kidney donation in the medium as well as in the long-term. Hemodialysis (HD) catheters are commonly used as temporary vascular access in patients with kidney failure who require immediate HD. The use of these catheters is limited by complications such as infections, thrombosis resulting in poor blood flow. We studied the complications and outcomes of nontunneled catheters used for vascular access in our dialysis unit. The records of all patients, with renal failure who were dialyzed over a two-year period and had a double lumen nontunneled catheter inserted, were retrieved. Catheter insertion was carried out under ultrasound guidance using the modified Seldinger technique. The demographic data of patients, etiology of chronic kidney disease, and complications and outcomes of these catheters were noted. Fifty-four patients with mean age 43.7 ± 15.8 years had 69 catheters inserted for a cumulative total of 4047 catheter-days. The mean catheter patency was 36.4 ± 37.2 days (range: 1-173 days). Thrombosis occluding the catheters was the most common complication and occurred in 58% of catheters leading to catheter malfunction, followed by infections in18.8% of catheters. During follow-up, 30 (43.5%) catheters were removed, 14 (20.3%) due to catheter malfunction, eight (11.6%) due to infection, five (7.2%) elective removal, and three (4.3%) due to damage. Thrombotic occlusion of catheters was a major limiting factor to the survival of HD catheters. Improvement in catheter patency can be achieved with more potent lock solutions. In Bangladesh, there are very few studies about biopsy proven adult Nephrotic syndrome (NS) with histological types and their clinical findings. To determine the histological types of glomerulonephritis (GN) in adult NS and correlate them with the clinical presentations and biochemical parameters, we studied 100 biopsies in 87 patients who underwent ultrasonography- guided renal biopsy in Rangpur Medical College and Hospital from July 2010 to June 2012. The mean age of the patients was 32.8 ± 13.2 years; male was preponderance (72.4%) and most of the patients (67.8%) came from rural areas. Membranoproliferative GN (MPGN) was the most common underlying cause that was found in 32 (36.8%) patients followed by mesangial prolife- rative GN in 27 (31%) patients, membranous GN in 16 (18.4%) cases, minimal change disease in four (4.6%) patients, diffuse proliferative GN in four (4.6%) patients, focal segmental GN, and focal proliferative GN in two (2.4%) patients each. High proteinuria level was found in minimal change disease, which was 7.59 ± 0.24 g/24 h (mean ± standard deviation). The most common symptoms were oliguria (92%) and edema (86.2%) followed by hematuria (dark urine) (72.4%) and hypertension (35.6%). MPGN was the most common histological type of adult NS in Rangpur. Compared to the general population, transplant patients receiving immuno- suppression have an increased risk of wound and systemic infection that might lead to hemorrhage. 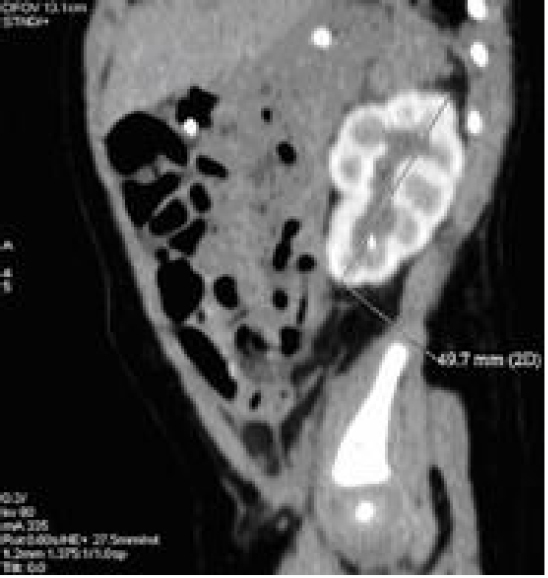 We present a case of severe bleeding from the external iliac artery secondary to a pelvic abscess following renal transplantation and transplant nephrectomy. A 73-year-old man received an extended criteria donor organ from a 49-year-old person who died from systemic sepsis. The patient bled from the Carrel's patch while awaiting a computed tomographic scan- guided drainage of an infected peritransplant collection. At exploration, a nonviable allograft surrounded by about 1 L of thick pus was removed. Bleeding from a 2 mm hole in the Carrel's patch was repaired by prolene suture as the external iliac vessels could not be mobilized due to a frozen pelvis. The patient died 72 h later from a massive bleed confirmed at postmortem to have originated from the external iliac artery distal to the anastomosis. Diversion of blood flow away from an affected area (with or without excision of the infected vessels) through a bypass procedure probably represents the best option in avoiding such sequelae. 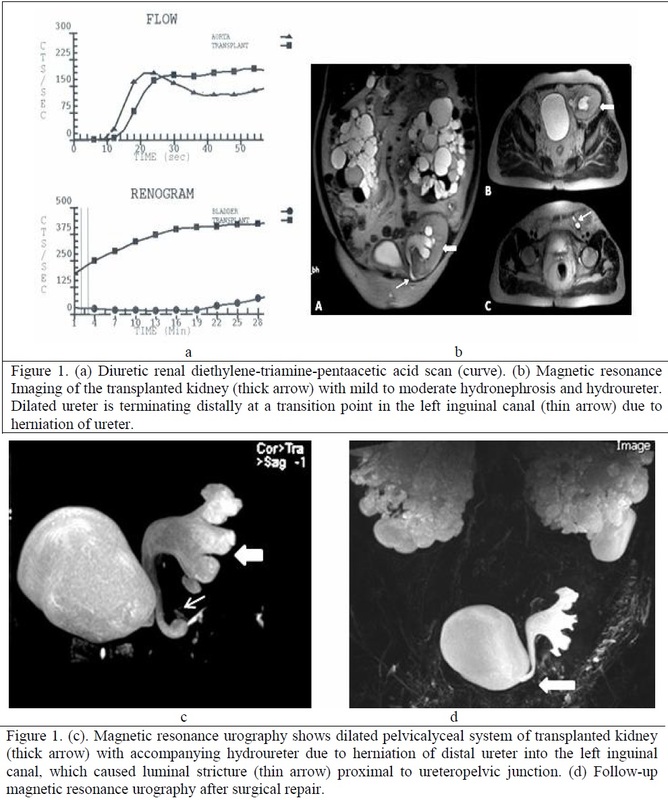 Nonocclusive mesenteric ischemia (NOMI) is a very rare occurrence after renal transplantation. This disorder is difficult to diagnose and can even be fatal. We describe a 51- year-old man with end-stage renal disease who developed intestinal ischemia and infarction due to NOMI three days after deceased donor kidney transplantation, which was managed success- fully and his renal graft function was saved. To the best of our knowledge, this is one of the few cases of NOMI occurring after renal transplantation reported in the literature. Human brucellosis is considered a great example of the complexity of clinical manifestations possibly affecting multiple organs or systems. Renal manifestations of human brucellosis have been documented in few case reports and one case series. Herein, we present a case of Nephrotic syndrome (NS) due to minimal change disease in the course of acute brucellosis. A 53-year-old male farmer was admitted to our department with acute brucellosis and NS. Renal biopsy revealed minimal change disease. Combined treatment with prednisone (1 mg/kg), rifampicin (600 mg/day), and doxycycline (200 mg/day) was initiated. Complete remission of NS was achieved at the end of the fourth week. One year later, the patient remained in complete remission of NS without any sign of relapse of brucellosis. Baclofen, predominantly excreted by the kidneys is accumulated in patients with renal insufficiency leading to the central nervous system toxicity. Here the author reports a patient with end-stage renal disease on maintenance hemodialysis (HD) who developed drowsiness and became unresponsive within a day after taking single 10 mg dose of baclofen. Patient improved completely after two sessions of HD. 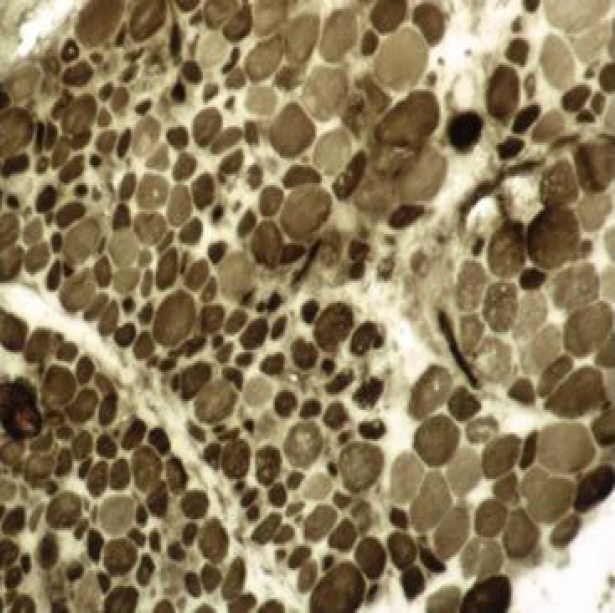 Cystinosis is an autosomal recessive lysosomal storage disorder characterized by the accumulation of the amino-acid cysteine in various organs and tissues. Infantile nephropathic cystinosis is the most severe form of the disorder. 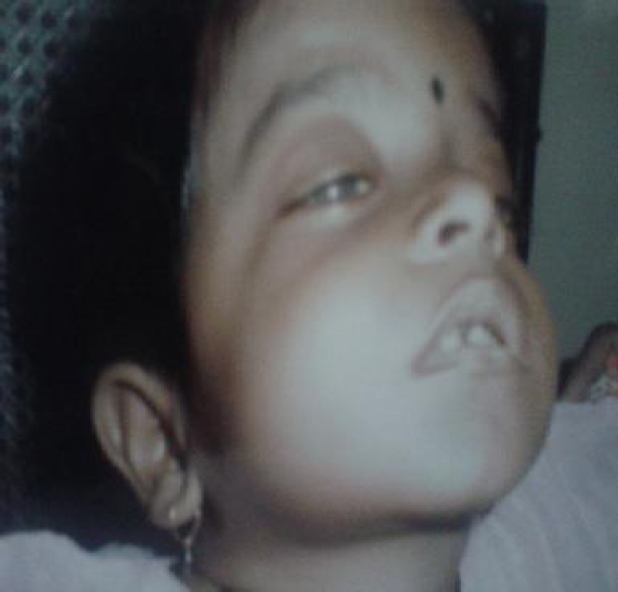 We describe the clinical features in a four and a half-year-old Indian boy with infantile nephropathic cystinosis that presented with the incomplete Fanconi syndrome, hydro-uretero-nephrosis with megacystis, and hypothyroidism. Renal Involvement in scleroderma is a known problem and the manifestations are well described. Renal involvement in systemic lupus erythematosus (SLE) is also well known. However, in scleroderma and SLE overlap syndrome, the renal findings may vary being a combination of features of immune complex mediated glomerulonephritis as well as thrombotic microangiopathy. We report a case in which the renal manifestation in such a situation was of a focal necrotising pauci-immune glomerulonephritis with crescents, anti-neutrophil cytoplasmic antibody negative. To the best of our knowledge, such manifestations have not been described before. Renal dysfunction in a normotensive setting in such a case should direct one towards evaluation for other causes and should prompt a kidney biopsy. This would be valuable in delineating the pathological process in the kidney and would help in guiding therapy. Primary hyperoxaluria is an autosomal recessive disorder due to a deficiency in the activity of the peroxisomal hepatic enzyme alanine-glyoxylate aminotransferase. It is a common cause of urolithiasis and end-stage kidney disease in children contrary to the adult phenotypic presentation which is considered a mild disorder with occasional urolithiasis. In this case report, we describe a 25-year-old man who presented with advanced and irreversible kidney failure within three months following strenuous physical training in the police academy. He had nephrocalcinosis and stones in one kidney. Diagnosis was confirmed by establishing the existence of extensive tubular and interstitial crystal deposition in his kidneys and molecular genetic testing. The case illustrates the need to establish an early diagnosis of this disorder to prevent the need for combined liver and kidney transplantation.